The deputy mayor of Greater Manchester has described cancellations to Northern Rail services for a third Sunday running as "chaotic and unacceptable". The rail operator said it expected 80 of the scheduled 1,500 train services on Sunday not to run. It said ongoing engineering works in Liverpool, Greater Manchester and Lancashire had caused "severe difficulties around the short-notice scheduling" of train crews. Anyone whose journey is delayed by half an hour or more can apply for compensation, Northern said. A spokesman said: "We are sorry that our customers continue to experience some disruption to their weekend services. "We are advising anyone thinking of travelling on Sunday on these routes to plan their journey carefully." In a letter to the rail operator's managing director, Baroness Beverley Hughes said: "As you are no doubt aware the Mayor has had to write to you, the Secretary of State for Transport and Transport for the North on a number of occasions over the past several months, and has also written to the Prime Minister, regarding what has been a chaotic and unacceptable situation. "It is disappointing that once again we are having to contact you directly regarding Northern's services failing to meet an adequate standard." She asked for reassurances that services would run the following Sunday and questioned what urgent steps were being taken to address staff shortages. 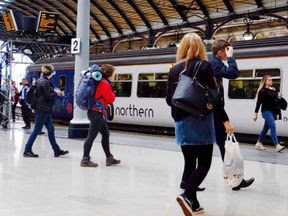 Northern cut nearly 170 services a day - 6% of the total - in early June after a new timetable introduced in May resulted in disruption for passengers. The operator reintroduced three quarters of the cancelled services last month but commuters have continued to experience problems on the network.